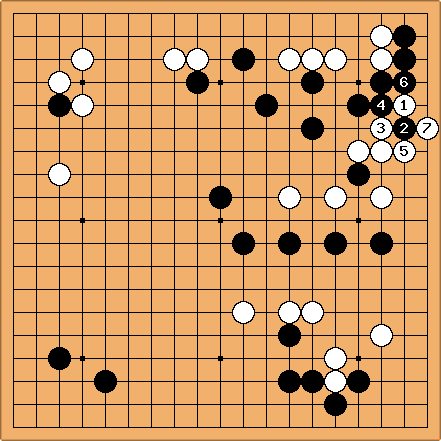 This ( and ) is not necessarily the continuation, but by playing the hane away from the position, White limits the loss to . To push through is usually bad. Black cuts easily with and now two white stones are cut off. Not striking across the keima, but cutting at as in this diagram is considered vulgar, since White sacrifices easily to build good shape. 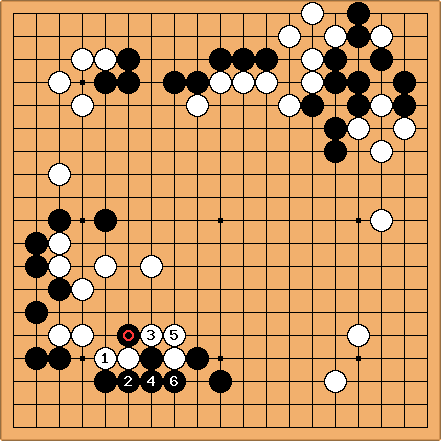 Black has captured but one stone. If the surrounding position is strong enough, White can extend (stretch). 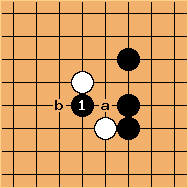 This is unlikely to occur, however, for if White were strong around, Black should not want to cut through the keima anyway. 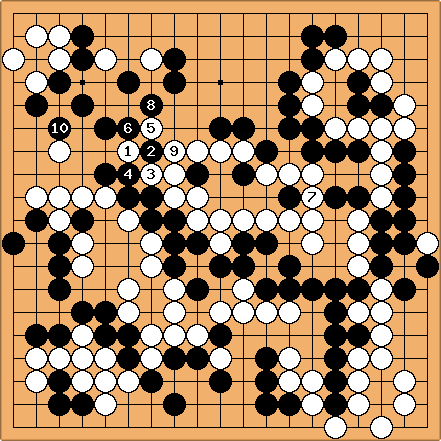 In this example is a sacrifice for shape and sente. togo: Connection in sente I would say. The shape does not look very spectacular to me. is a sacrifice for shape, sente, and aji. 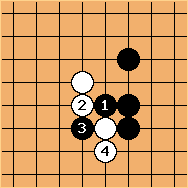 togo: Black gets a second eye in sente, if I see correctly. is a sacrifice, mainly for territory. togo: Connects in sente, I would say. could be a sacrifice for territory. However, . 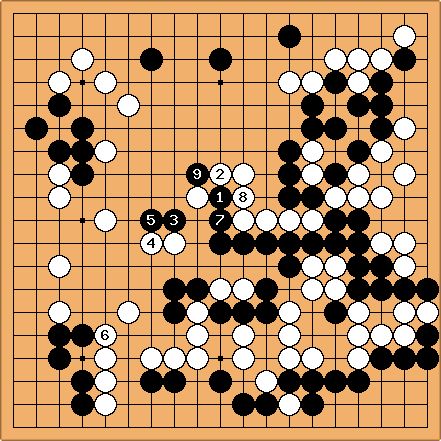 . .
White ends up capturing the stone and settling his group in sente. Black uses not one, but two tsukekoshi in a row to make life. 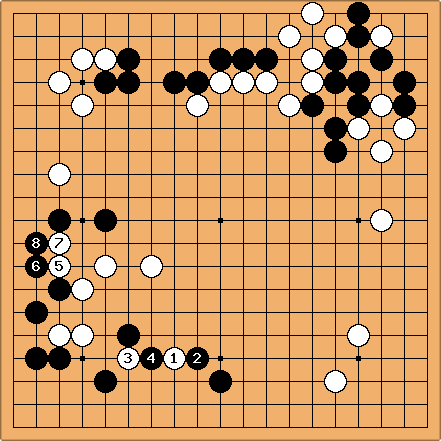 Hashimoto sacrifices to skillfully negotiate treacherous waters. 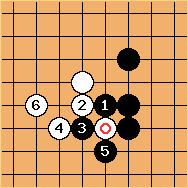 The Japanese term tsuke-koshi is literally attach across. For some time we have used waist cut but this is not necessarily standard terminology. 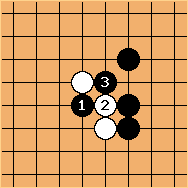 In Chinese, alone is called 跨 (kuā), the - - sequence is called 跨断 (kuā duàn). 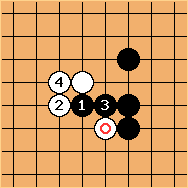 The character 跨 (kuā) means "straddle", and the character 断 (duàn) means "cut".